A few days ago, music star 2Baba made a call for a nationwide protest which was backed up by many other Stars like Yemi Alade, Davido, Burna Boy, Olamide and more, with Nigerians also showing their eagerness to step out and protest about the current government. 2Baba later made it clear that he was not the convener of the protest and rather he was giving voice, through his platform, to a message he had received. 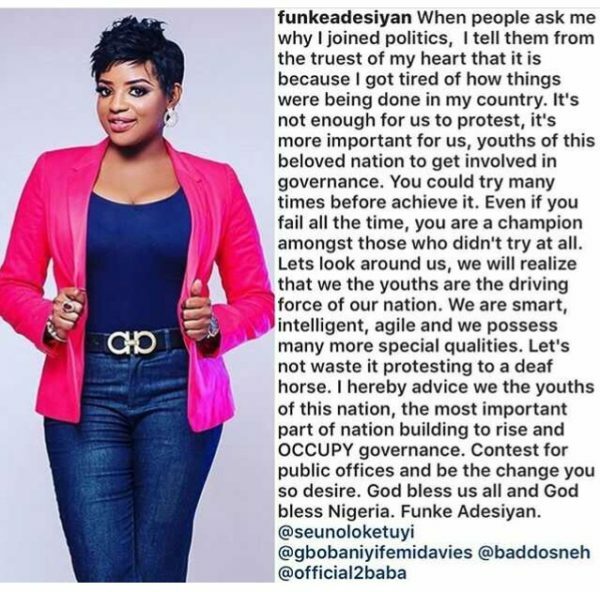 Last night Nollywood actress and politician, Funke Adesiyan took to Instagram to share her thoughts on the organized protest. According to her, it is no longer enough to protest, but to also join governance and make a change.